Compliance Engineering’s standard gain horn antenna series are linearly polarised and cover the frequency range 260 MHz through 110 GHz, depending on the horn selected. These standard gain horn antennas are ideally suited to EMI/EMC testing, direction finding, surveillance and antenna gain measurements. 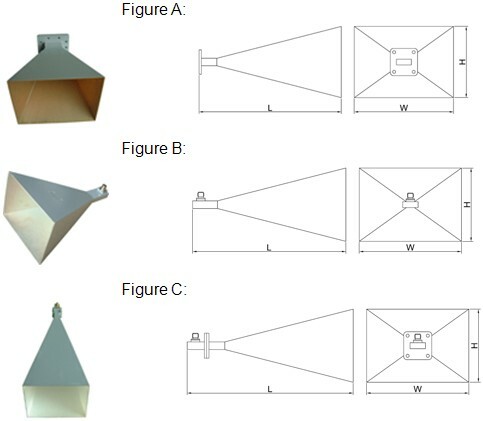 Standard gain horn antennas can be supplied in configurations with waveguide mating (figure A), coaxial connector mating (figure B) or waveguide mounting with a coaxial adaptor fitted (figure C). Waveguide to coaxial adapters can also be supplied.